Connect Apple MacBook to HDTV, projector for large screen display. Gold plating or Ni Plating for Connector. Color: both black and white are available. 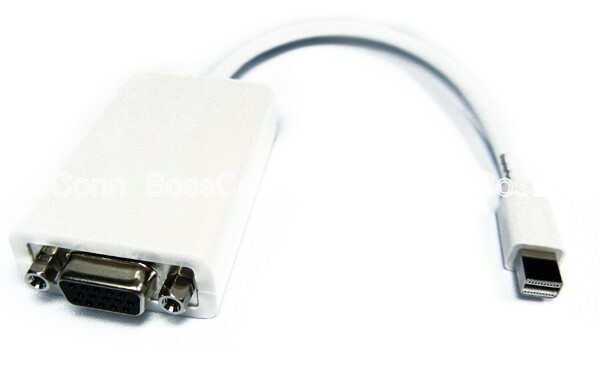 Mini DisplayPort 1.1a compliant receiver offering 1.62 and 2.7Gbps over 4 lanes. Support full DisplayPort link training. Video resolution up 1920 X 1200@60Hz. ESD protect: Human body mode at 8 kV. Machine mode at 400V and charged device mode at 2 kV. PC: VGA, XGA, SVGA, SXGA, UXGA and WUXGA. Apple: iMac, Mac Mini, Mac Pro, MacBook Air, MacBook Pro 13 inch, MacBook Pro 15 inch, MacBook Pro 17 inches.